Yesterday I spoke at Austin Mustard Seed Church on rest and Sabbath. It was a great opportunity to refresh my own understanding of what it means to find our rest in God. With the aid of Biblegateway.com I looked up a number of psalms that talk about resting in God, and compared how different versions translate the passages. Rest from a biblical perspective is definitely not about taking a nap when we are exhausted. In Psalm 62:1,2 one of my favourites verses on rest, The Message talks about breathing room for my soul. What a beautiful way to describe the rest we find when we wait quietly and allow the presence of God to fill us. Breathing room for the soul, that wonderful place of intimacy where we delight in God and God delights in us. Rest like this does not just happen however. These breathing room moments are created when we intentionally sit quietly imagining God in us and around us, filling us to overflowing with the wonder of a warm embrace. They are brief personal moments when we deliberately pause for time out from our busy schedules and allow a sense of stillness to dissipate the concerns of the day. 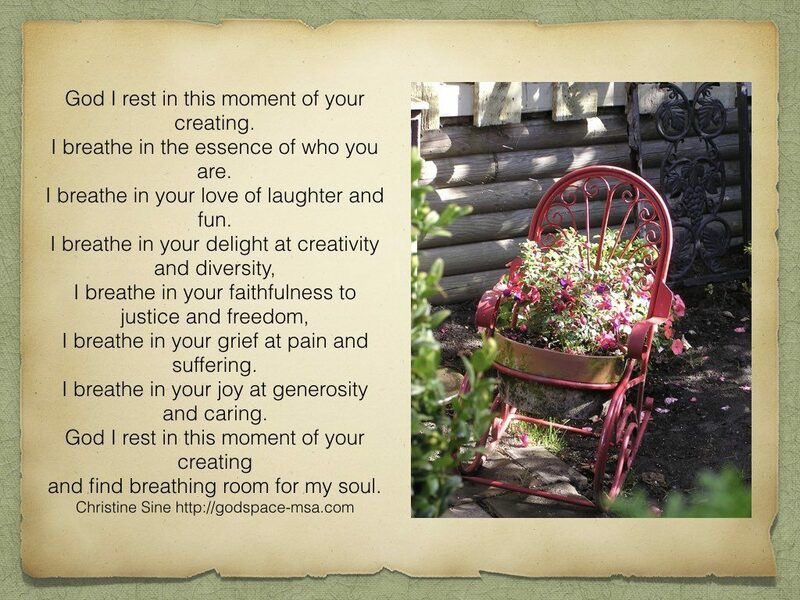 How Do We Cultivate These Restful Moments. 1. Take notice of the spaces that encourage rest – possibly a place in nature life beside a waterfall or in a garden corner; or a special at home place like a comfortable armchair, or a cosy meal with friends; or even at work place where we invite God into our office, a local coffee shop or a park bench. Taking notice of these places and visiting them regularly throughout the day is a wonderful way to experience breathing room for the soul. Question: What are the spaces you visit regularly that encourage you to enter the rest of God? 2. Notice the sensory experiences that allow our souls to breathe. For some it is sights like photos, written prayers or scriptures, religious icons or paintings. For others it is sounds like water cascading over rocks, bells ringing, birds singing. Still others find rest when the aromas of baking bread or the fragrance of flowers come to them. Or perhaps it is the feel of the texture of wood, or velvet or a loved one’s face that draws you into God’s rest. It can even be the taste of a good meal, a cup of coffee or a piece of chocolate. Question: What types of sensory stimuli allow your soul to breathe and enter the rest of God? 3. Recognize actions that encourage you to stop, rest and delight in God. Moses took off his shoes when he recognized that he had entered a holy place, and without his sandals on it was obvious that he was there to stay a while. For some of us it is kneeling, or raising our hands in the air that carries us into that place of rest. For others it is reciting a breathing prayer or walking the labyrinth. Sometimes it is in community with others – preparing a meal together, singing together, gardening together are all actions I have found can draw me into that restful presence of God. Even washing the dishes or vacuuming the floor are special, sacramental actions that invite some of us into the place where we delight in God. Question: What are the actions you can identify that encourage you to stop, rest and delight in God? Sit quietly, hands in your lap, palms upwards ready to receive from God. Close your eyes and take a couple of deep breaths in and out, visualize them flowing into your heart and your soul. Relax into the presence of God and imagine God in you and around you. Enjoy the wonder of God’s warm embrace. Bring to mind one thing that delights you about God. Sit for a moment and savour that delight. Now imagine one thing about you that God delights in. Sit still and allow the delight of God to fill you. Open your eyes and take out your journal. Write down what you experienced. You might like to respond with a prayer, a doodle, a sketch or even a song.